Here’s the notes for episode #061 of The Paleo Women Podcast. Be sure to check back every Tuesday for a new episode, and head over to iTunes or Stitcher to subscribe! 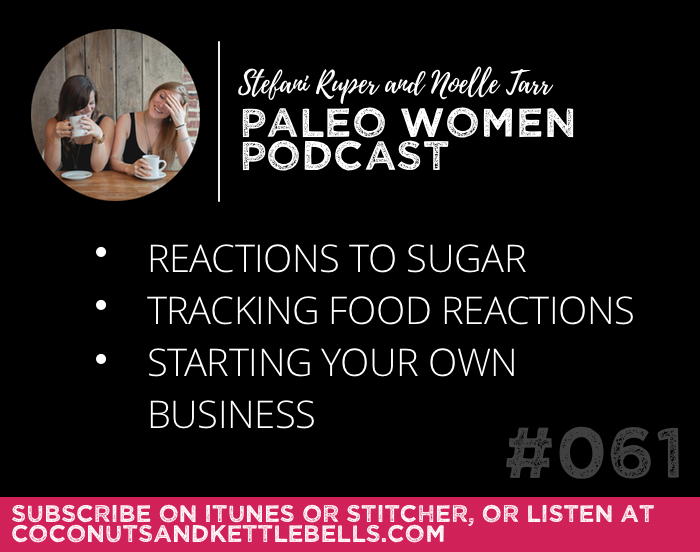 In this episode, Stefani and Noelle discuss reactions to sugar, how to go about tracking reactions to food, and facilitating the appropriate mindset when starting your own business. I’m so excited about Vital Proteins! I just used my last scoop of the collagen peptides the other day, so this is perfect timing to stock up on more :o) I can’t seem to get the coupon code to work…and that is a seriously awesome deal! Hi Laura! Just emailed our contact and it was a little bug on there website. Everything should be working now! 🙂 Thanks for letting me know! I loved this episode and think it would be amazing if you did an entire show about starting a business! I think a lot of the members of this community are passionate about helping others and would be interested in hearing from those who have done it. Thanks for everything you ladies do! Hi Annie! I would LOVE that! I think we’ll definitely do that in the future since it’s something I’m super passionate about. 🙂 Thanks for your support! To add further information, my symptoms definitely seem to be stronger from eating foods with processed sugar. Now that I think about it, it actually does seem to only happen with processed sugar, even if I eat the dessert at the end of a meal. You are so welcome, Vickie! Thanks for sending in your question, and for further clarifying here. Love hearing from you! I am also having some issues with the coupon code. I’ll keep trying though. Excited for your new sponsor! Still not working for me. Sorry! I’m having the same issue as Sarah. It tells me that the promotion code PWP was applied, but it doesn’t actually change the price at all on any item in my cart. This is a wonderful opportunity! Thanks for having such a great sponsor! It’s working now! Hooray!! Thanks! It’s good through October. Try clearing your caches, or doing the order in a different browser. Also, you’ll need to have 3 items in your cart for the coupon to work.